My friend and former Royal Gazette reporter Neil Roberts is a man after my own heart. 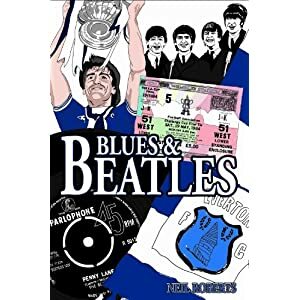 “What is life without football and music?” he asks towards the end of Blues & Beatles, his entertaining new book about growing up obsessed with Everton FC and the Fab Four – even though the band broke up the year before Neil was born … well south of Merseyside in St. Alban’s, Hertfordshire. In Neil’s case, his twin obsessions were passed down from his dad Colin, who hails from the Wirral, and the book tells how these become the touchstones through which father and son communicate and remain connected through the turmoil of a family breakup. I worked with both Colin and Neil at the Gazette (it was Colin, then the deputy editor, who picked me up at the airport when I first arrived in Bermuda in December, 1982), so I got a kick out of the island episodes – although knowing both of them, it was painful to read some of the more emotional episodes. But as someone who wears his heart on his sleeve, that’s to Neil Roberts’ credit. A former BBC and ITN reporter, he writes in a short, snappy style almost as if he is talking to camera and is unabashed about revealing his feelings, which are frequently touchingly sentimental, whether he’s recalling grandparents, old girlfriends or nervously meeting his heroes like Duncan Ferguson or his beloved Paul McCartney. He is, and always will be, a fan at heart and that passion runs throughout Blues & Beatles which is all the better for it. The person you end up really feeling sorry, though, for is young George, Neil’s son. At age 7 he is already following the twin family traditions (or curses?) even though he must already realise that Everton will only get into Europe again if there’s a war and that the chances of Macca making another decent album at his age are as likely as a Beatles reunion. The poor lad is doomed to a life of disappointment. Still, it will give him something to moan about in later life – just like a real Scouser!